One habit of highly effective email users have is limiting the amount of time it takes to move through their inbox each morning. Part of speeding through that process is understanding when (and how) to save longer articles and videos for later. Not only does it keep you from getting bogged down in your email inbox, it also allows you to enjoy the videos and articles more thoroughly later. A handy way to save those articles and videos? 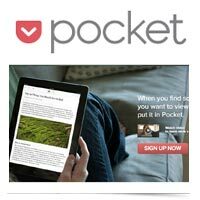 Pocket, an app which quickly and easily lets you save almost anything online directly from your web browser or other apps like Twitter, Flipboard, Pulse, and Zite. Even cooler? You can also view those saved articles and videos later across devices like your iPhone, Kobo eReader, or Android device.